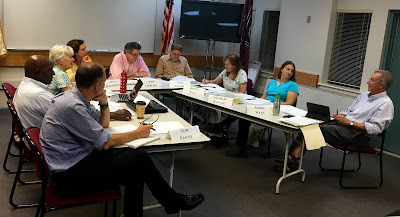 After an hour of discussion/debate the 9 member Charter Commission split along ideological lines with a 6-3 vote to hire the Collins Center for Public Management at UMass/Boston as their guide over the next year to help bring a new and improved government structure to our little college town. After the vote Gerry Weiss quipped that he would not "write a minority report" over this issue but earlier in the meeting described it as the, "First time we have a difficult decision to make." Why the three Town Meeting cheerleader (Weiss, Stein & Gage) thought the KP Law consultants would better serve their agenda is anyone's guess but they did seem to think they would be better at dealing with "conflict resolution" among the group. Which is sure to come up one of these days when the discussion to ditch Town Meeting comes to a vote. And when they lose that one by a 6-3 vote safe bet Mr. Weiss will surely write that minority report.